You have the options of placing an order by phone or online. To place an order by phone, call 855.COOKIES (266-5437). To place an order online, visit www.cookiesbydesign.com, select your product(s) of choice, select “Add to Cart” and proceed through the Checkout process to place your order. You should place your order at least 1 business day prior to your desired delivery or pick-up date. You can, however schedule a gift delivery or pick up as far in advance as you would like. 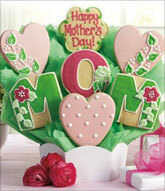 We also have some cookie gifts that are same day delivery in which you could place your order that same day. How can I remove an item from my cart? When you are viewing your Shopping Cart, select the “Delete” button that appears beneath the product description of the item you would like to remove from your cart. We’re happy to help our customers. Contact us at: 1.800.945.2665 or customerservice@cookiesbydesign.com. Tracking information is available in your confirmation email. 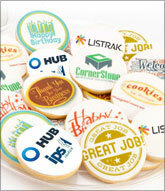 Contact us at: 855.COOKIES or customerservice@cookiesbydesign.com. How much room do I have for my card message? You have a maximum of 75 characters (that includes spaces and punctuation) for each card message. Yes! After selecting your Delivery Option and Checkout Method, you will be directed to a screen that will allow you to input information regarding your recipient. On this page, select the box labeled “I prefer to send this gift anonymously”. If you are ordering your product over the phone, please specify that you would like to send this gift anonymously to the Customer Service Representative. 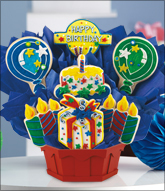 The Cookies by Design corporate organization does not offer gift card options for purchase. Yet, some of our Cookies by Design locations offer their own gift card options. This option varies per shoppe and may not be available at all locations. 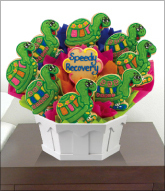 Can I personalize or customize a bouquet? Can I do it online? We pride ourselves in being Cookies “by Design” and while we have many designs and messages to choose from, we are more than happy to personalize and /or customize your cookie gift. Whether you want a special message, particular colors or a different theme, our cookie designers are happy to accommodate your requests. The best way to do this is to contact our Customer Service at 855.COOKIES (266-5437) to discuss your needs. For an online purchase, you may only change the message that appears on the “message cookie” within your gift (maximum of 25 characters). What if I want to place a custom order at a shop? We’re excited to bring your designs to life! Find contact information for your nearest location here. What is the difference between a Bouquet, a BouTray and a Basket? Why isn’t it taking my promo code? There may be a few reasons why the site isn’t accepting your promo code. First, check the expiration date of the promotion. Second, check that you have met the minimum requirement to activate the promotion. Lastly, check to make sure that the promotion is not an “in-store” promotion only. If those three qualifications are satisfied, then you may be visiting our site from one of our affiliate sites (in which we don’t allow promotions from), where you will need to clear your browser history to continue with the promotion code towards your purchase. If none of these solutions worked for you, please give us a call toll free at 855.COOKIES (266-5437) so that we can further assist you. Why can’t I pick same day delivery if I picked a same day bouquet? 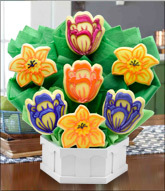 As we do offer same day bouquets, each cookie gift must be ordered by a certain time and depends on the recipient location to be available for same day delivery. If you need your gift by a certain time, please be sure to check the same day delivery availability prior to ordering. Do you have military discounts or senior discounts? At this time, we have not implemented any Military or Senior specific discounts, yet we encourage everyone to take advantage of our continuous promotions and special offers that are both available on our website home page and through our CookiEmail subscription. Do you have sugar-free cookies? At this time we do not offer sugar-free decorated cookies. However, some locations offer two varieties of sugar-free gourmet cookies. Contact the location in your recipient's area to find out if they offer these cookies. Find a Cookies by Design location and enter your recipient's zip code. You can also obtain this information by calling our toll free locator service at 1-855-COOKIES (266-5437). Yes, we offer many of our decorated cookie designs in a gluten free recipe. Our gluten free cookie gifts are just as beautiful and delicious as our original cookie gifts. Our cookies are completely handmade, from the first steps of mixing the dough and icing to baking and then hand decorating each one individually. I need to place several orders to send to multiple locations. What is the best way to do this? We have a Corporate Gift Program as a one-stop service for corporate customers who wish to place multiple orders. If you want to send orders to multiple locations, contact our Corporate Gift Program at gifts@cookiesbydesign.com, or call directly at 800.347.3110. During the online ordering process you will be charged a service fee. We charge this modest fee for online administration and order processing to the delivering shoppe. Can I send cookies to a hospital or college? Yes! We guarantee our cookie delivery to the mailroom or receiving department of colleges, hotels or hospitals. It is then up to those departments to deliver the package to the correct recipient. We encourage you fill out as much information in the fields provided for the recipient to ensure that your gift is delivered in the most efficient manner.